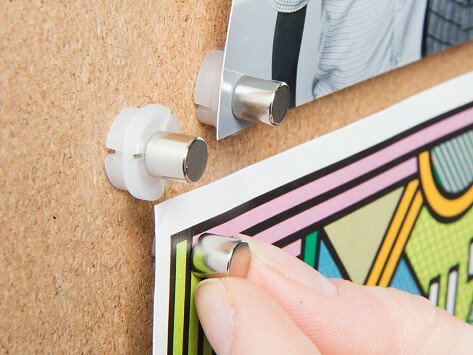 Magnetacks are push pin magnets that hang photos, posters, and other keepsakes without putting holes in them. Push the base into the wall like a regular tack, then hang your item by attaching the magnet. Arrange and rearrange as many times as you like, no harm done. The silver matte finish adds an elegant touch, too. Best product I have found. They are the best Hangers I have ever used or seen. We all have photos, invitations, and other unframed art we want to display. Thumbtacks do the trick, but they eventually tear your keepsakes. Magnetacks use magnets to hold your items in place without any damage. Maker Bryan Pinchuk was a college student who wanted to show off concert tickets and posters without putting holes in them. He realized that push pin magnets would be the perfect solution, but couldn’t find any on the market. So he made his own. Magnetacks are Made in the USA and come in two sizes—XL for walls and Classic for cork boards and other shallow surfaces. They’re good-looking and easy to use—push the base into the wall like a regular tack, then attach your item with the matte silver magnet. 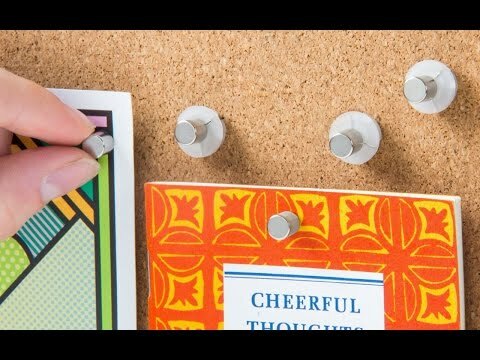 Use Magnetacks for collages, holiday cards, posters, or your little one’s artwork. Display your keepsakes again and again, no harm done.